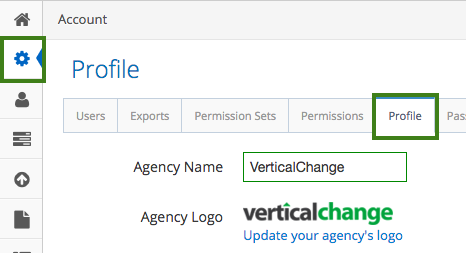 You can update your agency name and logo through your Account section. Then click on the Profile tab. To update your agency's name, type in the Agency Name field. 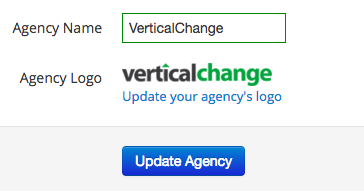 To update your agency's logo, click the Update your agency's logo link, and upload an image file from your computer. When you are done, click Update Agency. The agency name will be updated on the home page, and the logo will be updated on PDF documents that are exported from VerticalChange (such as contact details and form results).